Find hotel near Basilica Of San Francesco .. The Basilica of Saint Francis of Assisi is a Church situated in the town of Umbria region and this is where Saint Francis took birth and died. The basilica is one of the most prominent places in Italy for Christian pilgrimage and is a unique landmark for those who visit Assisi. The Church began in the year 1228 and has been built on the side of a hill. It comprises of two Churches that are known as the Lower Church and the Upper Church. Both the Churches are decorated beautifully with several paintings of late medieval painters and the quality of these works gives the Church a distinctive importance in exhibiting the Italian’s art development. If you admire wonderful architecture and art, a visit to the Basilica of Saint Francis of Assisi would be a delightful experience. 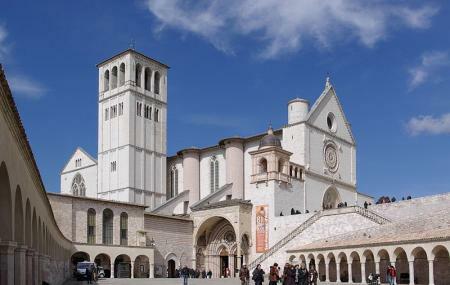 How popular is Basilica Of San Francesco D'assisi? People normally club together Via Eremo Delle Carceri and Agriturismo Le Mandrie Di San Paolo while planning their visit to Basilica Of San Francesco D'assisi. Beatiful. Peaceful. Spiritual. Love this place. It call for meditation and reconciliation with yourself and God. The whole complex is worth a visit of more than one day. I'll be back because it's worthy. It was the 1st time I saw a cathedral with two floors and a basement! Quiet magnificent. Also the town of Assisi is good for a walk. it is a magic and spiritual place full of peace and holiness. i love Assisi and San Francesco. it is one of my favourite saints.